Flash Transmissions #4 Sectaurs: Warriors Of Symbion! Intercepting a faint transmission from a distant planet. Lock on target..destination the Insect Planet Symbion..Home of the Forgotten clan of Sectaur’s.. When you think of Coleco many instantly think of gaming. Well as a kid I remember a friend of mine who had a Colecovision console which I wanted badly. Coleco also manufactured many of my favorite childhood video games and were highly regarded for their efforts in the early 1980s hand-held sports gaming market!. If anyone remember Donkey Kong and Ms. Pac-Man Coleco was behind the launch of these 80s classics! I was lucky enough as kid to have several Coleco Table top Video Games such as Donkey Kong, Frogger, and Galaxian! That’s another post for another day! 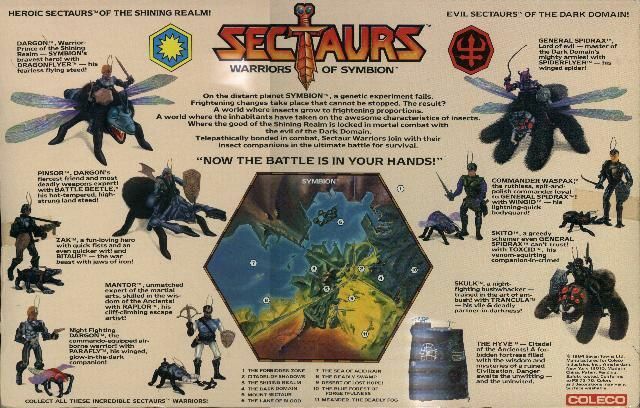 The gaming Giant also had significant wins in the toy industry as well..such as it was with their profit explosion with the giant Cabbage Patch Kid craze Coleco also tested the lucrative boys toy market with one of the oft not discussed Warriors of Symbion..The Sectaurs! 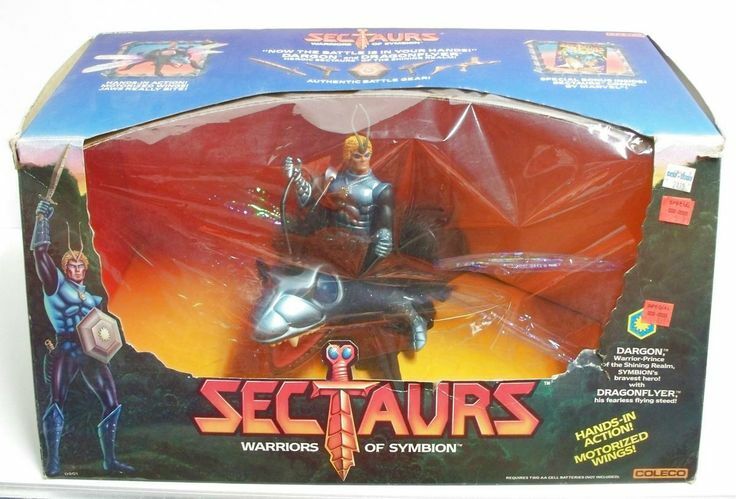 I had no idea what in the heck these things were as my only exposure to the toys was on a TV toy commercial which was enough to sold me on the line and as it was with X-Mas at my house one year was dedicated to Symbion’s best Warriors….THE SECTAURS!! My one Sectaurs regret is that I never owned a Dargon figure!! One of my friends had the fancy silver series 2 figure that I always secretly lusted after but alas I never acquired the central figure to the entire collection..instead I had the second stringers..Zak, Mantor, Pinsor..and No Dargon!! The toys themselves came in cool windowed packaging and the deluxe figures came with highly detailed fur covered insects that the Sectaurs could ride on!! The insects were mounted on a black glove that you could put on your hand that would resemble the insects legs!! The insects design were very well done! 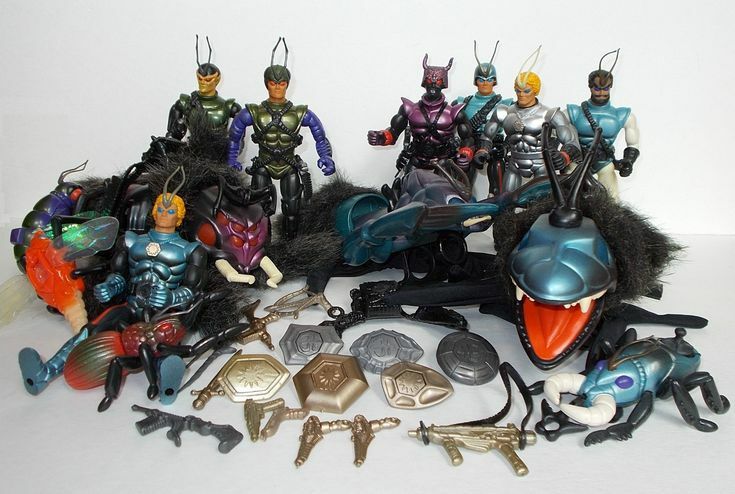 In-fact if you were stumbling through a bin of old toys it would be the Sectaurs insects that would stop the common man dead in his tracks. The deluxe sets were amazing and if any of my subscribers has one to give away (Shameless plug) Old Charlton Hero here will certainly help a brother out! 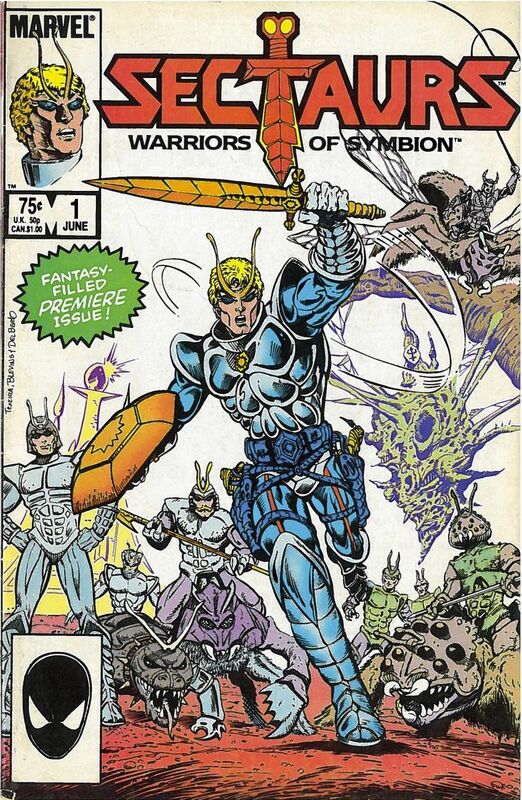 As with all cool toys of the day they also were backed by Marvel Comics and had a short-lived but great Comic Book! I collected several of the comic books but I was unfortunately not in a hotbed for comic collecting and missed several issues that I later grabbed at a “Nice Price”! Issue #1 was like salt in the wounds with a full-blown Dargon cover!! I still love this cover to this day and wonder would Sectaurs last if released today? I guess we will never know….this writer says YES we will see Sectaurs again take that to the bank! Satellite Extra: Even though this is a Flash Transmission not intended to be a long post..for the hell of it I will include all 5 episodes of The Sectaurs mini cartoon series!! Take care Heroes! Enjoy! !